From regulatory affairs to patient services, professional opportunities in the biopharmaceutical industry extend far beyond the lab bench, as evidenced by these industry pros. According to a 2017 Consumer Reports survey, Americans are relying on prescribed drugs more than ever. The number of prescriptions filled between 1997 and 2016 rose from 2.4 billion per year to 4.5 billion. Of course, the U.S. population grew during this time, accounting for some of the increase, but pharmaceutical breakthroughs created new medicines where none previously existed. By all accounts, this trend should continue into the future. Drugs, however, weren’t the only segment in healthcare to experience major developments over the past few decades. The biomedical industry made impressive inroads, both technologically and financially. With the exception of 2015, the industry posted consistent growth year after year. What’s more, Statista.com predicts the sector will continue this steady pace into 2022. So why are experts so keen on the future of the pharmaceutical and biomedical industries? Partly because people continue to fall ill and injured. Plus, there’s a continuous call for medical improvements. So, naturally, there’s an on-going need for scientists, engineers and developers who will make these discoveries. But those aren’t the only professions critical to the process of researching, developing, manufacturing, marketing and distributing new drugs and medical technologies These industries require a vast infrastructure of diverse experts to fulfill diverse operations. Meet five of those successful individuals here who shed light on other career possibilities in pharma and biomed. When Nyra Bannis walked down the halls of Shire headquarters in Lexington, MA for a job interview in 2010, she expected to see a nicely decorated office. She didn’t anticipate to be greeted by smiling portraits of patients lining the walls. “I fell in love with the company, culture and patient population,” she recalls. Bannis accepted the job offer from the biotechnology company, and has since concluded its commitment to patients runs much deeper than just a few pictures on display. Now, as head of immunology patient services, nearly everything Bannis does revolves around the people receiving products from Shire’s immunology portfolio, which treats diseases such as Alpha-1 antitrypsin deficiency, hereditary angioedema and primary immunodeficiency. Her team assists individuals suffering from these conditions obtain the company’s prescribed medications in light of any economic and insurance obstacles. “Insurance plans can be difficult to navigate. For example, patients often need prior authorization or appeals for certain medications from their healthcare providers, particularly for rare diseases. We get them connected to resources. We also help them get the information they need about financial assistance,” she explains. Anyone who has tussled with health insurance companies knows you may have to manage many requests for documentation. That doesn’t intimidate Bannis and her team. Rather, they derive satisfaction from guiding patients through the paperwork maze. Unlike technical disciplines that function with well-defined hard skills, Bannis says careers in patient services rely more on soft skills, such relationship-building. “I often think you can teach a lot of technical skills. You can teach about insurance and reimbursements. You build those skills with good training programs and time. But folks who have a passion for working with people and solving problems for people, who have empathy and are good listeners, and who are passionate about this work, are always going to be successful,” Bannis advises. Does Shire have a prescription for your career success? Find out at jobs.shire.com/job-search-results. Follow the company on Facebook, Twitter and YouTube. From Mark Gayle’s point of view, there’s no job, assignment or task too tough to turn down. And having put in nearly 30 years in the medical device industry, he’s overcome plenty of tough challenges that have tested his knowledge, problem-solving skills and ingenuity. Those successes have laid an interesting career path for him, including expanding into new roles, from engineering to quality assurance to leadership. Currently Gayle serves as the vice president, quality assurance for transcatheter mitral and tricuspid therapies and pilot operations at Edwards Lifesciences. “I oversee the end-to-end quality activities of our medical devices from development and manufacturing through to commercialization for transcatheter mitral and tricuspid therapies and pilot operations for Edwards Lifesciences in addition to the pilot manufacturing for our transcatheter aortic and surgical valves,” he says. The Irvine, CA-based company has always been committed to getting to the heart of matters, literally. Founder Miles “Lowell” Edwards decided to put his mechanical engineering expertise to work designing an artificial heart. That mission led to numerous state-of-the-art heart valve technology discoveries during the past 60 years. While studying industry happenings, Gayle kept abreast of the company’s activities, and was impressed with the advances being made in this highly specialized area. So much so, in fact, that his interest in the organization was piqued when window-shopping for his next career opportunity. “Edwards was my top pick [of employer] due to the innovative work it was doing in the structural heart space, particularly in developing transcatheter aortic valve replacement technology,” he explains. Although accepting tough tasks comes with a degree of risk, Gayle firmly believes the return on investment surpasses the risk. In his case, the payoff has been professional recognition. “We operate in an environment where everyone is smart and brings a lot to the table,” he remarks. While not everyone will tackle tough assignments, he advises young professionals to identify what they wish their brand to convey, and then find opportunities to reaffirm it. “You must take ownership and relentlessly manage your development,” he states. Does Edwards Lifesciences have a prescription for your career success? Find out at www.edwards.com/careers/home. Follow the company on Facebook, Twitter, LinkedIn, Instagram and YouTube. By now you’ve probably heard the old adage: if you love what you do, you’ll never work a day in your life. Sometimes that advice seems more like a pipedream than reality, especially if you’ve already invested years into a career that doesn’t exactly stoke a passion. Then again, you haven’t met Charita Hill-Avent. 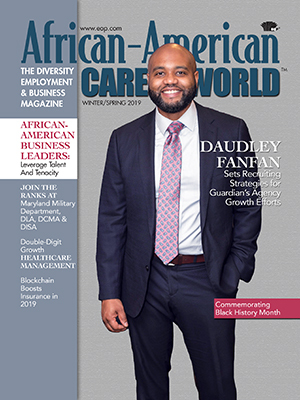 “My three most valuable pieces of advice [to job seekers] are find something you’re passionate about, love what you do, and don’t be afraid to take opportunities to learn, stretch and grow,” says Hill-Avent. After receiving an undergraduate degree in accounting, Hill-Avent landed a position with a computer hardware producer. She moved up the hierarchy, fulfilling jobs in corporate financial planning and analysis, investor relations, corporate auditing and manufacturing finance. She then switched to an agricultural and commodities business and focused on investor relations. The work was interesting enough, but the industries didn’t stimulate her. Her days involved performing duties rather than investing in a company and her future with it. Instead of settling, Hill-Avent took the chance to redirect her career. “I always had an interest and passion for healthcare, and upon attending graduate business school, I made the decision to pursue a career in that industry,” she says. Hill-Avent followed her passion and went to work for Roche, an international pharmaceutical organization. She served several business groups, including commercial marketing and new product launches. She also assisted traditional finance functions, such as revenue reporting and finance analysis. In 2010 she moved on to Genentech, which had been acquired by Roche the previous year. Based in South San Francisco, CA, Genentech is a leading biotechnology company with nearly 40 medicines currently available. At the moment, Hill-Avent is the director for financial shared services. “I manage several different departments that focus on financial operations, including treasury, travel and expense management, corporate credit card, and general finance and accounting,” she explains. However, Hill-Avent didn’t fall into complacency since entering her ideal industry. In addition to earning her MBA, she earned a second master’s degree in applied psychology, industrial and organizational behavior. “I had been in my job for more than 15 years, but became passionate about organizational psychology, and now I’m able to combine both areas,” says Hill-Avent. She’s acting on other passions, too. Among the messages she conveys to students and job candidates is that the industry is open to a multitude of disciplines. Does Genentech have a prescription for your career success? Find out at gene.com/careers. Follow the company on Facebook, Twitter, LinkedIn, Pinterest, Instagram, Google+ and YouTube. Olympus Corporation of America is forever linked to some of the major innovations of the 20th century, including its parent company producing Japan’s first microscope. By the mid-1930s the Olympus brand was hailed as one of the finest in camera lenses. And by 1950 it had created the world’s first gastrocamera. More than half a century later, high-tech imaging devices continue to be a critical medical tool, and Olympus Corporation of America, headquartered in Center Valley, PA, continues to lead the segment. “Endoscopes take images, so it makes sense this is a camera company, and it makes sense we digitize images,” states Daphney Germain-Kolawole, senior project manager, regulatory affairs. Like a lot of graduates, Germain-Kolawole thought she had an idea of where to begin her career, but was willing to consider other possibilities. Being open to exploring industries turned into a gateway when she accepted an offer to join Johnson & Johnson’s regulatory affairs department. Germain-Kolawole ended up spending more than a decade with Johnson & Johnson, specializing in regulations for its spinal products before joining Olympus six year ago. Now she applies her regulatory expertise to gastrointestinal and abdominal devices. “When I was hired, there was a new product orientation course where sales trainers displayed the product, discussed how it worked, and what treatments are used,” she explains. While product knowledge is step one when submitting an application to the U.S. Food & Drug Administration (FDA) to gain approval to be sold in the U.S., the process can be a long journey. To carry out her due diligence every step along the way, Germain-Kolawole relies more on communication skills than she does on science and engineering. Patience is another skill Germain-Kolawole has developed. “The FDA may come back with questions and requests for clarifications. We might have to modify products or even pull them. The FDA application process is highly regulated, and that can prevent companies from moving forward, especially if the agency disagrees with the application,” she explains. Keeping her motivated is the knowledge that all of these efforts ensure patient safety. “If your mother, daughter or brother was going to have a surgery, you want medical devices that are safe. That is what the FDA is doing. It also works with the industry to make sure innovative products get out there and are working for patients,” Germain-Kolawole concludes. Does Olympus Corporation of America have a prescription for your career success? Find out at olympusamerica.com/corporate/corp_careers.asp. Follow the company on Facebook, Twitter, LinkedIn and Glassdoor. Using technology to advance medicine reflects Anyanwu-Ofili’s two main interests. Although she didn’t always think that way. She intended to become a practicing physician. Then an opportunity in college to participate in research projects, followed by an internship with a biotech company inspired her to change her goals. Instead of medical school, Anyanwu-Ofili wished to seek professional success in the biopharmaceutical industry because it combines technology, science and medicine. In fact, this approach further drove her quest for knowledge. While in her first job, Anyanwu-Ofili pursued a master’s degree. Then she returned to school full-time for a doctorate in computational science and cardiology. Upon completion, she was anxious to return to the industry. Acting on the advice of a mentor, she applied to Janssen Pharmaceutical Companies of Johnson & Johnson. Based in Raritan, NJ, Janssen focuses on six key areas: cardiovascular and metabolism, immunology, infectious diseases and vaccines, neuroscience, oncology and pulmonary hypertension. Last year IntebrandHealth recognized Johnson & Johnson/Janssen as one of the most valuable corporate brands in the biopharmaceutical industry. The organization has also appeared on the Productive Innovation Index, which acknowledges an organization’s ability to discover and commercialize new medicines. What Anyanwu-Ofili values most about her role as a computational scientist for Janssen Research & Development is that every project involves a multidiscipline approach. “You’re working as a team to overcome challenges on a daily basis,” she says. She also maintains connections with academic researchers. “Even though this is not an academic institution, and you have to think about what to do as a business, you’re still required to think like an academic. You’re expected to publish and contribute to the scientific community while thinking of the business,” Anyanwu-Ofili explains. Another collaboration important to Anyanwu-Ofili is the mentoring she’s received from upper management. She specifically sought relationships with individuals who demonstrate an ability to meet professional and personal commitments. Does Janssen Pharmaceutical Companies of Johnson & Johnson have a prescription for your career success? Find out at janssen.com/us/careers. Follow the company on Facebook, Twitter and YouTube. Subdek (223 words): It’s long but please keep as is, as it has good info. Thanks!